Students in grades 3-5 have been learning about the various components of fitness. In the past few weeks, we explored the components of cardiovascular endurance, muscular strength, muscular endurance, and the importance of incorporating those into daily physical activity. 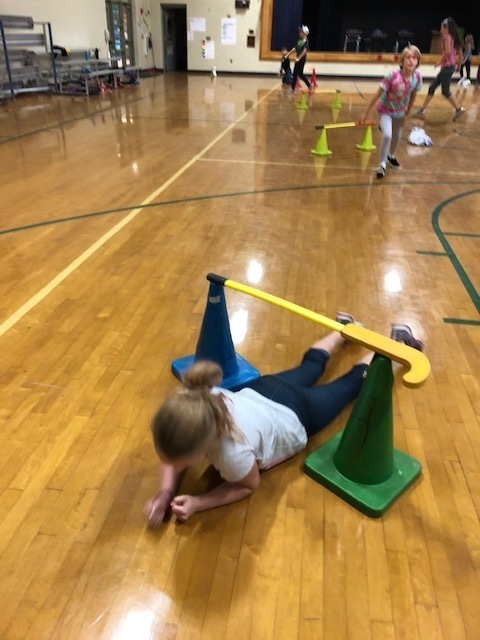 Students worked in two activities to learn firsthand how these components work together into physical fitness. While one group walked and ran for 12 minutes to focus on cardiovascular endurance, another group moved through and under cones and sticks to work on building their core and arm strength. After 12 minutes, the groups switched activities to experience all three components of fitness. Fitness is important and learning about how to "move through" the various components can help kids learn how to be creative and physically fit at the same time.